With the QPP 2019 proposed rule, CMS is consciously trying to make QPP participation meaningful and less burdensome for the clinicians. Addressing the opioid crisis is another prominent overarching goal for 2019. For the Improvement Activities category, the modifications proposed are geared towards fine-tuning, addressing the existing gaps, and aligning the IA category closely with other performance categories, specifically Quality and PI. The weight for the Improvement Activities performance category stays the same at 15%. The performance period will also remain unchanged, a minimum of 90 continuous days. The eligible clinicians can also choose to report data as individuals or as a group for any duration greater than 90 days, up to a maximum of 365 days. The Improvement Activities category largely remains the same as that of 2018 including the clinicians with special status eligible for earning double points, and the threshold of 50% sites for Patient Centered Medical Home (PCMH) to get full credit for IA. However, some noteworthy changes are proposed. As the 2015 Certified EHR is proposed to be mandatory for 2019, the bonus points for reporting certain Improvement Activities via the EHR is being taken away. These activities will no longer accrue bonus points under the Promoting Interoperability category. In order to raise clinician awareness about the public health emergencies, like the opioid epidemic, CMS has proposed a new criterion for nominating Improvement Activities for 2019 and beyond, “Include a public health emergency as determined by the Secretary”. If the proposed measure simplification for the Promoting Interoperability category is approved, the criterion titled, “Activities that may be considered for an advancing care information bonus” will become irrelevant and hence is proposed to be removed. Both the Patient Safety and Practice Assessment proposed measures have been proposed to be weighted “High” as they address the opioid epidemic (a public health emergency) and are aimed at ensuring patient safety. These activities correspond to a high priority measure proposed under the Quality category and the two opioid measures proposed under the Promoting Interoperability category. Achieving Health Equity Comprehensive Eye Exams Medium Improve access to comprehensive eye exams by communicating it’s importance by providing literature and/or facilitating a conversation with underserved and/or high-risk populations that would benefit from it. Beneficiary Engagement Financial Navigation Program Medium Help patients or their caregiver understand costs of care and explore of different payment options by providing financial counseling. Behavioral and Mental Health Completion of Collaborative Care Management Training Program Medium Encourage integration of behavioral health into the primary care practice by providing credit for comprehensive training. Care Coordination Relationship-Centered Communication Medium Emphasize relationship-centered care and clinician-patient communication by providing credit for eight hours of related training. Patient Safety and Practice Assessment Patient Medication Risk Education High Address the Meaningful Measures priority area of Prevention and Treatment of Opioid and Substance Use Disorders and clarify the role of clinicians in management of concurrent prescriptions. Patient Safety and Practice Assessment Use of CDC Guideline for Clinical Decision Support to Prescribe Opioids for Chronic Pain via Clinical Decision Support High Ensure that clinicians utilize CDC Guideline for Prescribing Opioids for Chronic Pain via clinical decision support (CDS) by integrating it into the clinician workflow (e.g. EHR-based prescribing prompts). i. Care transition documentation practice improvements (IA_CC_10): Description modified to clarify how specialists can/must keep the Primary care physicians (PCP) in the loop while providing patient-centered-care and the transition of care. ii. Chronic Care and Preventative Care Management for Empaneled Patients (IA_PM_13): Examples of evidence based, condition-specific pathways for care of chronic conditions have been added for clarity. iii. Participation in MOC Part IV (IA_PSPA_2): Two examples have been added in which clinicians can participate in Maintenance of Certification (MOC) activity – Safety Certification in Outpatient Practice Excellence (SCOPE) and American Psychiatric Association (APA) Performance in Practice modules. iv. Use of Patient Safety Tools (IA_PSPA_8): Opiate risk tool (ORT) added as an example of safety tools that specialty practices employ in caring for their patients. v. Implementation of analytic capabilities to manage total cost of care for practice population (IA_PSPA_17): Added American Society for Gastrointestinal (GI) Endoscopy’s GI Operations Benchmarking Platform as an example of a platform with the necessary analytic capability. IA_PM_9: Participation in population health research Participation in research that identifies interventions, tools or processes that can improve a targeted patient population. IA_PM_17: Participation in Population Health Research Participation in federally and/or privately funded research that identifies interventions, tools, or processes that can improve a targeted patient population. 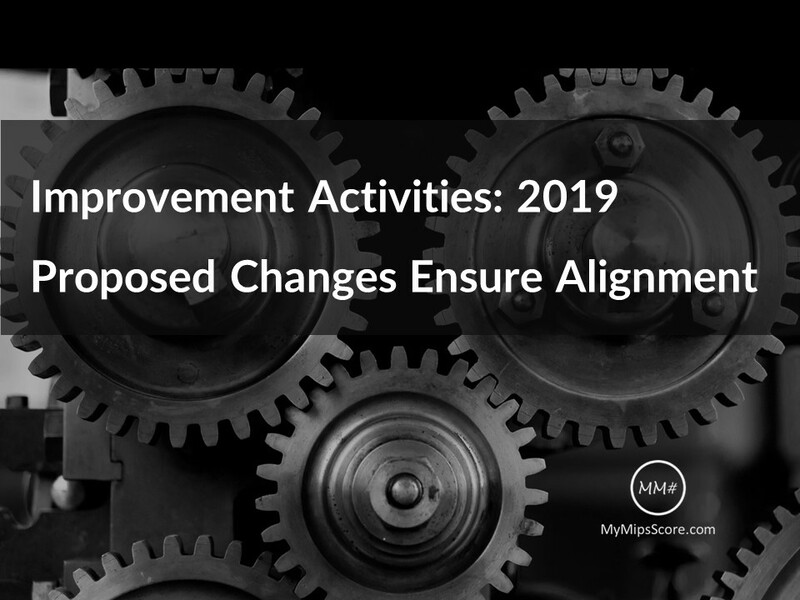 Based on the two-year experience of the effort it takes to evaluate an Improvement Activity that has been nominated, CMS proposes to expand the submission time-frame of nominations while delaying the year for which the nominated improvement activities would apply. The IA nominations received in (Feb 1 - Jun 30)2019 will be considered for implementation in 2021. A time lag of two years is a big change as compared to the current time for measure consideration (less than a year). The proposed rule for 2019 also clarifies the considerations for selecting improvement activities for the CY 2019 and future years takes other factors into account in addition to the established criterion. For instance, whether the nominated Improvement Activity duplicates any currently adopted activity and whether it utilizes publicly available products or techniques for completion. The proposed rule also sheds some light on the weight determination of Improvement Activities. For instance, the Improvement Activities that require significant investment of time and resources are weighted high. CAHPS for MIPS survey serves as a good example. In comparison, the activities that are less time and resource intensive would be classified as medium weighted activities. Thus, all the Improvement Activities will be deemed to be medium-weighted unless they warrant considerable time and resource investment. In summary, although drastic change is not on the cards for Improvement Activities category in 2019, significant updates are to be expected. CMS continues to evaluate the IA category to eliminate the irrelevant activities and add more specialty specific activities and activities that address the public health emergencies in future years. The 2019 QPP Final Rule will be released this November. Stay tuned for the insights and updates. Older PostMIPS and The Godfather: "This is the business we’ve chosen."